ANCHORAGE, Alaska The honorary mayor of a tiny Alaska town is noticeably absent this week, when he should be hanging out at the general store or sipping his water-catnip concoctions from a wine glass at the pub next door. 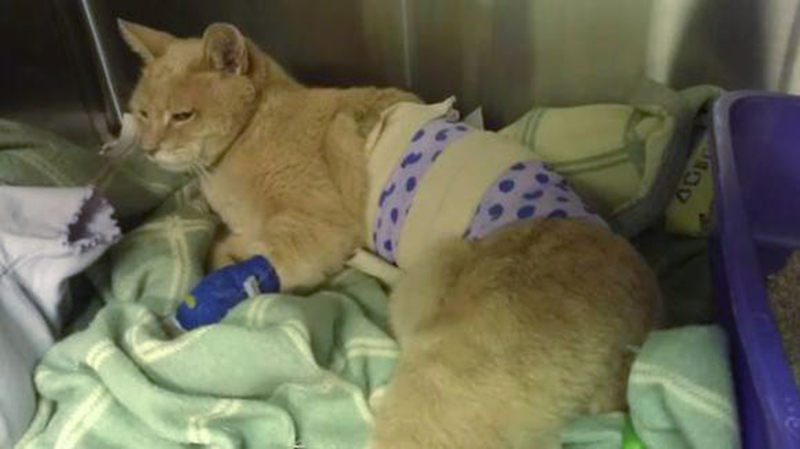 Instead, Stubbs the cat is sedated and under veterinary care after he was badly injured in a vicious dog attack in Talkeetna, a quirky community of 900 that elected him in a write-in campaign 15 years ago. Talkeetna has no human mayor, so you could say 16-year-old Stubbs is the reigning leader  of the feline sort, anyway. "He's everybody's guy," said Stubbs' owner, Lauri Stec, who manages Nagley's General Store, where the orangey-beige cat lives and mingles with locals and tourists alike. Saturday's attack by the loose dog left Stubbs with a punctured lung, bruised hips, a long deep gash on his side and a sternum fractured to the point it might need to be repaired with a plate. Stec has reported the attack with borough animal control officials. Because the cat was so severely injured, Stec has not been allowed to visit him at the veterinary clinic that took an hour to get to after the nighttime attack. A local veterinarian went with her for the long drive in heavy rain. Because it wasn't a sure thing that Stubbs would even make it to the emergency treatment, the vet took along a euthanasia kit. Stec has gotten the go-ahead to pay a brief visit to Stubbs Thursday afternoon. The next few days will be crucial in his recovery, but the cat has begun to sit up and eat. A tube inserted his lung has been removed. All in all, Stubbs is holding his own, Stec said. "He's a freaking tough boy," she said. Stubbs also gained multiple fans outside of Alaska when word got out about his role in town, a popularity that earned him national stories and visits from tourists stopping in the community that serves as the last stop for travelers and climbers visiting Mount McKinley, North America's tallest peak. The town, 115 miles north of Anchorage, is purported to be the inspiration for the town in the TV series, "Northern Exposure." It's a place dotted with artist shops, where bachelors are auctioned off at a yearly fundraiser ball and where women compete in a wilderness contest. Even in such a place, Stubbs is a star. "We all love him," said Geoff Pfeiffer, a waiter at the West Rib Pub and Cafe located inside the same building as the general store. The staff there is hanging on to Stubbs' wine glass, hoping they get to fill it again with water and a catnip garnish, a feline cocktail for a regular who commands attention every time he comes in. "It's like Elvis has entered the building," Pfeiffer said. If the dog community believes b/c the Mayor was declawed he won't fight back they're wrong. Dead wrong. Old Yeller wrong. UPDATE: the Mayor is still in critical condition. A Laser Pointer Vigil is scheduled for later this evening. No dogs, obvs. Before Saturday, Stubbs had already used up a few of his nine lives. In the past, he has been shot by a BB gun, and still has a BB lodged inside. He's fallen into a cold fryer vat at the West Rib when the staff was changing the oil. He rode on a garbage truck before jumping off. His is a big personality, both in his adventures and social encounters, letting people pick him up and photograph him. "He's a little pistol," Stec said. "He's got a great personality." She's not alone in thinking that. Donations from well-wishers as far away as Australia have been pouring in for Stubbs' veterinary bills. There's also a jar for donations at the general store placed near a photo of Stubbs.